I have some exciting news to share! After months of being on the waiting list, I was finally approved to shirts on Amazon! Obviously this is great because I can reach way more people via Amazon than I could with some of the smaller “print on demand” websites I am using (and will continue to use). Also if you have Amazon Prime you get FREE SHIPPING! Yay! Another great thing about Amazon is the ability to sell double-sided designs, which meant I was finally able to design something I’ve been dreaming of for a while! 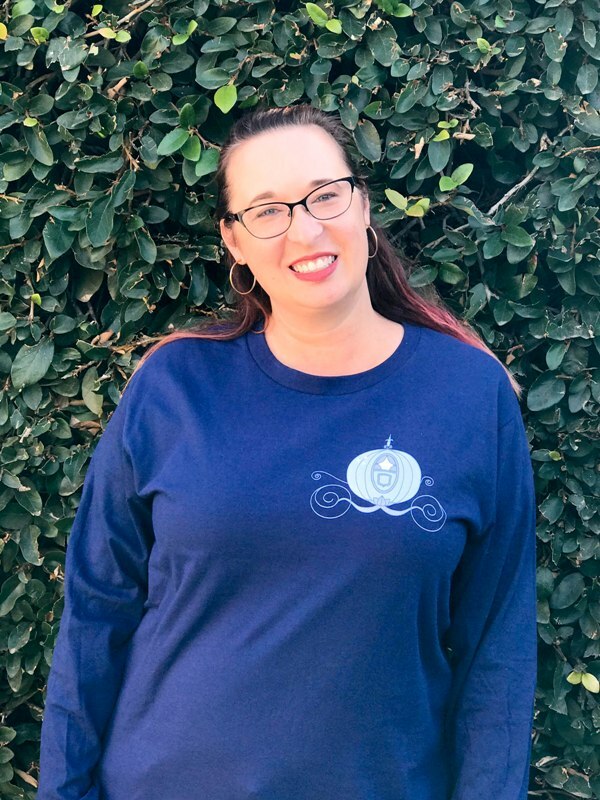 The Fairy Tale Bride Spirit Shirt is reminiscent of the sweatshirts that are all the rage at the Disney Parks right now! 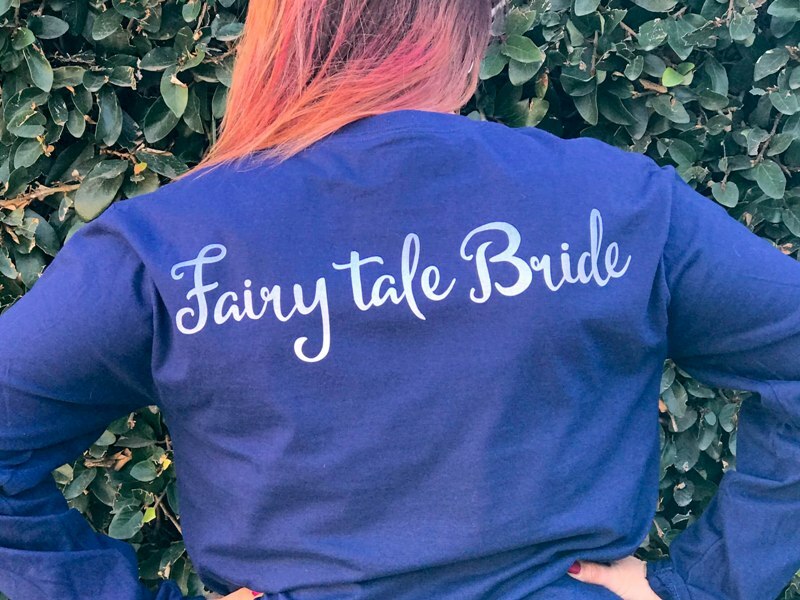 This is a long sleeve cotton shirt with a light blue carriage (the same one as my other designs) on the front of the shirt and the phrase “Fairy Tale Bride” in a blue ombre print on the back of the shirt. 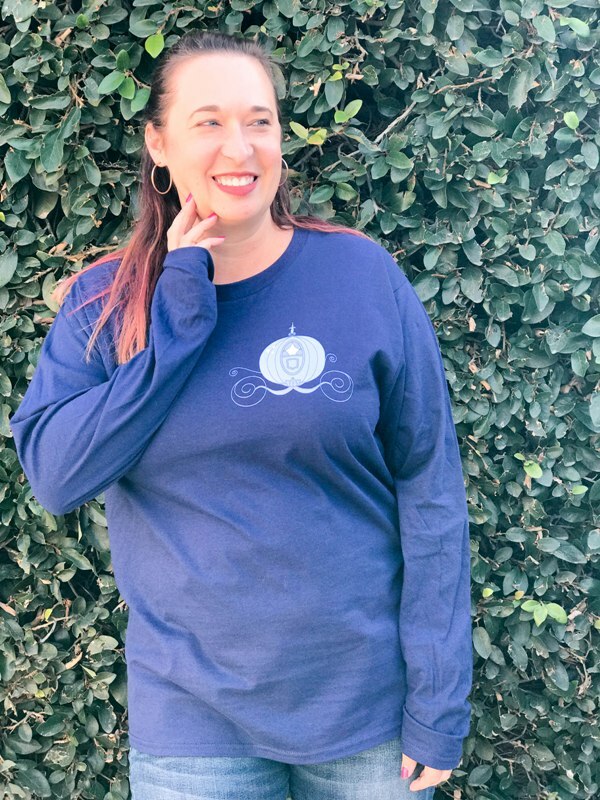 Right now the only color available is Navy blue which is great because it works with the design perfectly! Although Amazon says black and grey long-sleeve shirts are coming. This is a unisex shirt so ladies will want to size down if you want the shirt to be fitted. I am wearing a size Large, and generally am a size 12/14. You can see by the pictures it’s baggy on me, although I expect it to shrink a bit after the first wash since it’s 100% cotton. 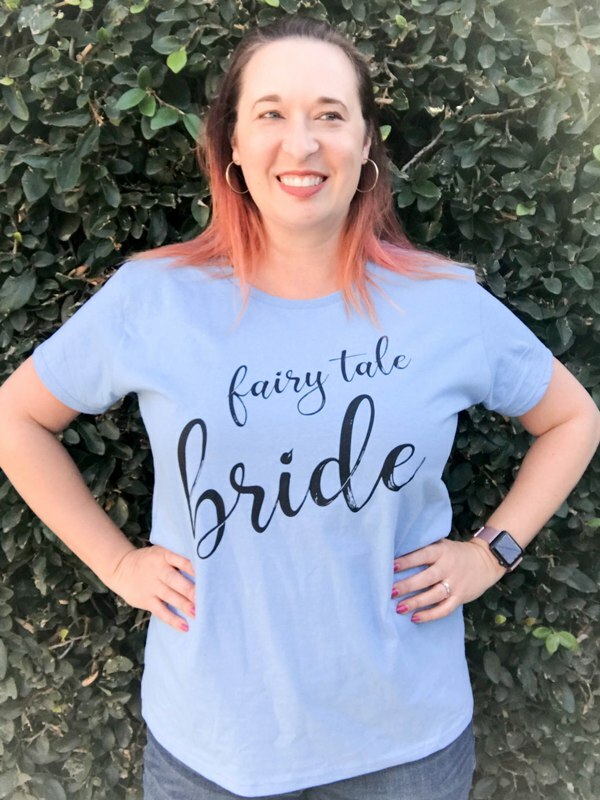 Also available on Amazon, this “Fairy Tale Bride” t-shirt that’s just perfect for bachelorette parties or bridal showers or just every day wear because, DUH, why wouldn’t you want to brag about your royalty status to the entire world?! This shirt is available in Women’s and Men’s sizes. I am wearing the XL Women’s shirt in baby blue, which is slightly fitted. If you want a very fitted shirt, order true to size. If you want it to be slightly bigger, order one size up or order a Men’s shirt. The black print is available on white, baby blue, lemon, pink, and heather grey shirts. The solid color shirts are 100% cotton so keep in mind they may shrink in the dryer. The heather shirts are a cotton/poly blend. The white print is available on black, navy, dark heather, blue heather, and cranberry. The “This Princess is Engaged” shirt features tiara and diamond ring icons and would be super cute for engagement photos! The black print is available on white, baby blue, heather blue, pink, and heather grey shirts. The white print is available on black, navy, cranberry, dark heather, and heather blue. Finally, my first honeymoon specific design! The shirt reads “Fairy Tale Honeymoon in Progress” with a duo of little hearts and royal-inspired design elements. The black print is available on white, baby blue, heather blue, pink, and royal blue shirts. The white print is available on black, navy, dark heather, heather blue, and purple. 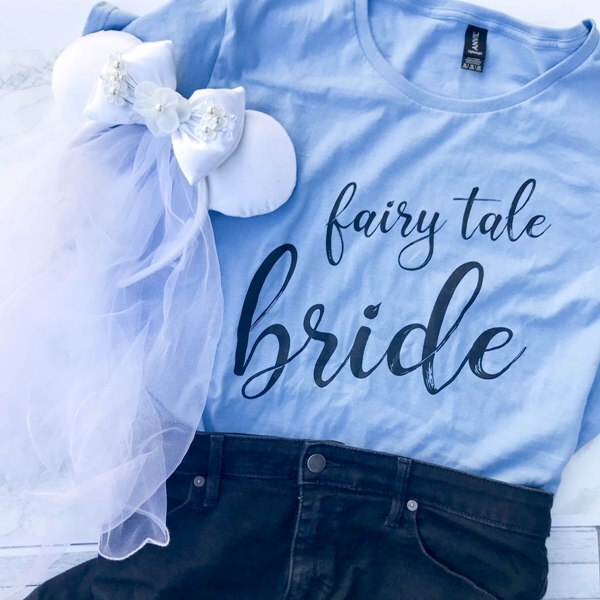 The Fairy Tale Wedding Planning Shirt would be perfect to wear to your planning session! And if you’re visiting Disney for your first anniversary, this “First Year of Happily Ever After” shirt is a must! Thanks to everyone for your continued support of my designs! I love when you tag me in your product photos; it makes my entire day! ALSO, I want to know what designs YOU want! What type of shirt would you want to wear? I want to stay in the fairy tale & wedding niche but I love to hear your suggestions. Obviously I cannot use any terms that are trademarked or intellectual property of another corporation, but I want to hear your ideas! So cute! I bet that spirit style shirt will be very popular! It’s sold the most on Amazon so far!